And it’s raining CBO scores. President Trump is pushing Republican senators to keep working on a health care bill. It has been a very confusing week in federal health care policy. Early in the week, the Senate abruptly abandoned an effort to pass a bill to repeal and replace parts of the Affordable Care Act after four senators said they wouldn’t support it. Senate Majority Leader Mitch McConnell then said he would push to pass a bill that would repeal parts of the law in two years, buying the Senate more time to come up with a replacement. Three senators quickly said they wouldn’t support that approach, and the Senate all but gave up. That lasted until President Trump called various senators to the White House, pressuring them to keep working until they agreed on a bill, just a day after he suggested letting Obamacare fail. Like I said, it’s been a confusing week. There are some obvious reasons that the GOP is having a hard time coalescing around a plan. Part of the problem is that Republicans don’t agree on the priorities for repeal. The conservative wing of the party wants to peel back regulations and reduce federal spending. Moderates are concerned about changes to Medicaid, the state-federal health insurance program for the poor, and reduced support for low-income people who are buying private insurance. Two have also said they don’t support defunding Planned Parenthood for a year, as would happen under each of the bills. 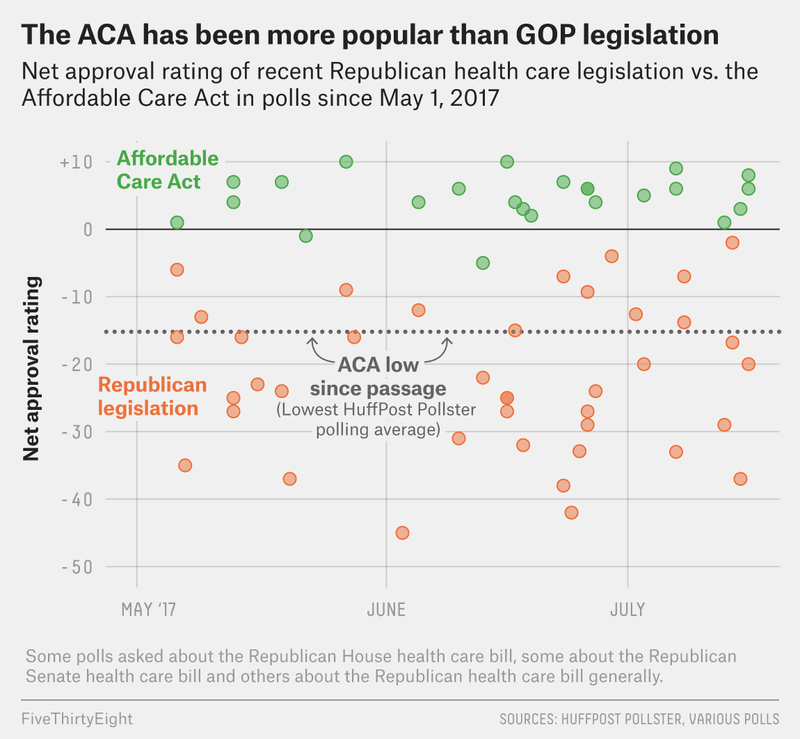 Then there’s the challenge of the GOP bills’ lack of support from the public. You’d be forgiven for not knowing where things stand on the seven-year Republican promise to repeal and replace Obamacare. There are at least three bills floating around, each with opponents within the Republican Party and varying levels of detail about what the effect of each plan would be on the health insurance landscape. What’s in the bill: This legislation — a new version of the measure that has been debated since the first draft was released on June 22 — would reduce subsidies for people who buy insurance on the marketplaces set up by Obamacare. Some of the Obamacare taxes would be repealed (though two taxes on the wealthy would remain in place). It would allow states to opt out of many of the insurance market regulations, including mandatory coverage of “essential health benefits,” which include maternity care and mental health treatment. The legislation would also freeze the Obamacare expansion of Medicaid. The expansion opened up the program to all people earning under 138 percent of the federal poverty limit in states that opted in.1 Starting in 2020, the expanded part of the program would take no new enrollees, and states would be reimbursed significantly less for those who continue to be covered (under current law, the federal government would pick up 90 percent of the cost of those enrollees). The bill would also put most of the rest of the Medicaid program on a budget. States would receive a maximum fixed amount per enrollee, or a lump sum for the whole state program, rather than the open-ended reimbursements they get today. Altogether, the bill would decrease costs for higher-income, healthier people without employer-sponsored insurance and would increases costs for lower-income, sicker people. What we know about its effects: The bill was posted Thursday, and a Congressional Budget Office analysis of it released the same day found that 15 million fewer people would have insurance coverage next year and 22 million fewer would be covered in 2026, compared with how many would be covered under current law. Premiums would increase over the next two years even as the plans those premiums pay for cover less, according to the CBO, but would decrease starting in 2020. This plan would reduce the federal deficit by $420 billion over a decade, according to CBO estimates. Who supports it: It’s not yet clear how senators feel about it, although there are clues from previous, similar iterations of the bill. It’s unlikely to please conservative Sens. Ted Cruz of Texas, Mike Lee of Utah, Rand Paul of Kentucky and Ron Johnson of Wisconsin, who have said that previous iterations of the Senate bill, similar in many ways to this version,2 didn’t do enough to cut regulations. Several moderate Republicans have also expressed concern about the proposed changes to Medicaid funding. What’s in the bill: This version of the bill is largely similar to the one above, but it includes a complicated amendment adopted from a proposal by Cruz. The change would allow insurers who sell regulated, Obamacare-compliant plans to also sell largely unregulated plans. Insurers would be required to offer coverage to people with pre-existing conditions and cover essential health benefits for the Obamacare-compliant plans, and they wouldn’t be allowed to charge based on how sick a person is. Insurers selling these plans, however, could likely also sell plans that cover far fewer services and could deny people coverage based on their health status or charge them more for these plans. What we know about its effects: The amendment is so complicated that HuffPost reported that it could be a month before it can be fully analyzed by the CBO. The Senate needs a score of the bill before it can proceed with a vote, so it asked the Department of Health and Human Services for an analysis; HHS hired the consulting firm McKinsey to produce a report, which the Washington Examiner obtained Wednesday. The report purportedly shows that premiums would drop under the Cruz plan, but experts say it offers little in the way of useful information, as Sarah Kliff explained at Vox. For starters, it looks at how the amendment would work if added to existing law, not the Republican bill. Experts believe it would gut protections for people with pre-existing conditions by pricing them out of the market. The insurance industry has come out hard against the Cruz plan. In a memo circulated publicly, America’s Health Insurance Plans, one of the insurance industry’s largest trade associations, condemned the amendment, while Blue Cross Blue Shield Association, a lobbying group representing the insurer, told Senate leaders the proposal was “unworkable.” Health policy experts warn that if the Cruz amendment becomes law, healthy people will buy on the unregulated, cheaper market, leaving people with more health care needs on the Obamacare markets. Who supports it: Four senators have previously said they would not vote to move forward with debating this bill: Lee, Paul, Susan Collins of Maine and Jerry Moran of Kansas. Only 14 senators have expressed clear support, according to The New York Times. What’s in the bill: This bill would repeal much of the ACA starting in 2020, though some changes would take effect immediately. The bill would repeal the ACA’s expansion of Medicaid, as well as the subsidies that help people buy insurance on the private marketplace. It would repeal all of the taxes created by the ACA and eliminate a fund created for public health work after 2018. It includes numerous other changes as well, such as eliminating requirements on what services state Medicaid programs must cover. The repeal bill would, however, add $1.5 billion over two years to respond to the opioid crisis and funding for community mental health centers. It would also retroactively (to 2016) get rid of the requirement that employers offer coverage to employees and the requirement that most people have insurance — by eliminating the financial penalties for both. What we know about its effects: The CBO (which has had a busy week) released an analysis of this bill on Wednesday. The agency thinks 32 million additional people would be uninsured in 2026 (compared with current law) and that the federal deficit would be reduced by $473 billion during that time. The estimated increase in the number of uninsured people includes 19 million who would fall from the Medicaid rolls. But millions would also be uninsured as a result of an upended insurance market, according to the analysis — the agency found that premiums would roughly double by 2026 and that about three-quarters of the population would live in places where no insurer would be willing to sell coverage in the private market. Of course, this strategy is built around developing a replacement plan over the next two years. But it’s impossible to say what that would look like. Meanwhile, with the immediate repeal of the individual insurance mandate, some 17 million would be expected to lose coverage next year. Who supports it: Notably, Sen. Lamar Alexander of Tennessee said after a meeting on Wednesday that he didn’t think there were even 40 senators who supported the strategy of repeal and then replace later. Several senators, including Collins, Lisa Murkowski of Alaska, Shelley Moore Capito of West Virginia, have already come out against the approach. To date, 19 states have chosen not to expand the program. This new version of the bill includes additional funding for opioid treatment, would allow people to use pretax health savings accounts to pay for premiums and keeps some taxes that had been cut in previous iterations, among other changes.